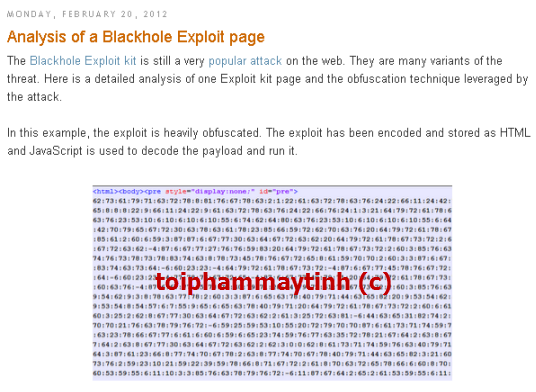 The Blackhole Exploit kit is still a very popular attack on the web. They are many variants of the threat. Here is a detailed analysis of one Exploit kit page and the obfuscation technique leveraged by the attack. I can now execute the script. The obfuscation requires many passes to fully decode the data andit takes quite a while to complete. Now, let's examine the output from Malzilla. The first part addresses a "Please wait page is loading..." message, very typical of the Blackhole Exploit kit so that the victim remains patient while the exploit code executes. Separating the exploit into an encoded payload and a decoding loop made it easier for the exploit kit creators to create an infinite array of different pages in order to evade detection. The Exploit kit is also more sophisticated than many other exploits as it is able to use the right exploit for each visitor. Khái niệm Cyber Crime là gì? [RAT] Người tấn công BKAV bị tội gì? [MMO] Đăng ký tài khoản AlertPay như thế nào? [Security] Is this your family’s digital life? [RAT] Mobile Marketing thì đúng hơn? [News] Tóm đối tượng đã tấn công WebScan.